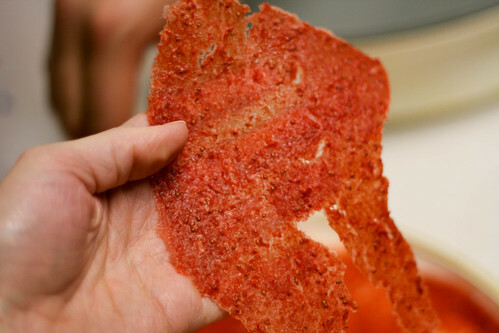 Did you know you can make your own fruit leather? I guess I knew that in theory, but it just never crossed my mind as one of those things I’d actually try. Ok, so this is one of those things that Nick tried. I’m too honest for my own good! Fruit leather is ridiculously easy. 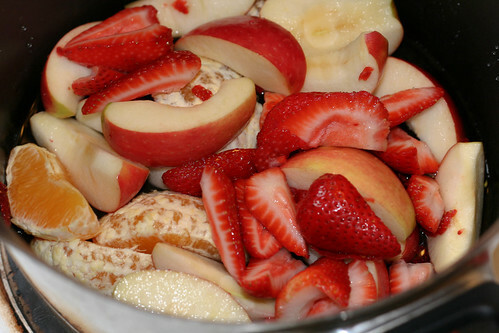 All you do is boil some fruit in water, puree, and dehydrate. We spread ours a little too thin, but that’s an easy fix for next time. Even still, we were able to get some pretty sizable chunks. And it all tasted perfect, even the little flakes! This is one of those infinitely changeable recipes. 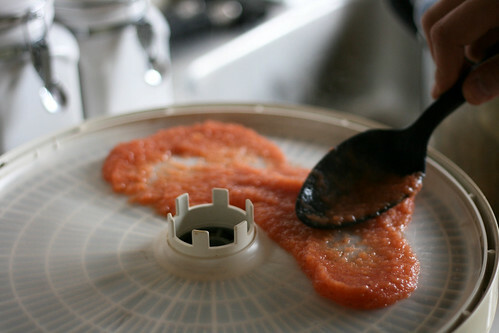 You can use whatever kind of fruit you want, and dehydrate it all at once. Then you’ll have fruit leather all summer long to bring with you on camping, floating and hiking trips! I’ll give you the recipe we used, and as we make this more often, I’ll post variations. I’d love to hear how you do it, too! **Please wash all your fruit! I hate to sound preachy, but I know more people who don’t wash their fruit than I care to think about. Combine all ingredients in a sauce pan. 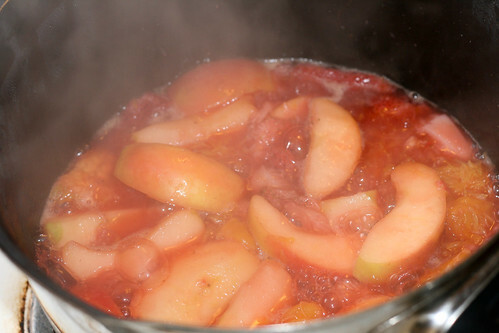 Gently boil until fruit is very tender, about 15-20 minutes. 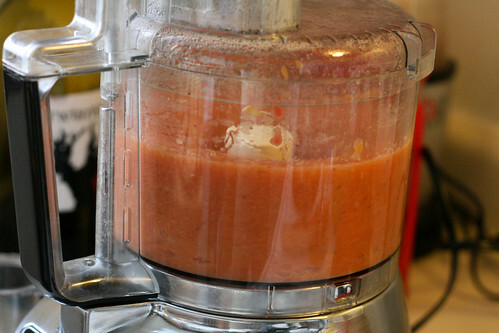 Transfer fruit and liquid to a food processor and puree until smooth. 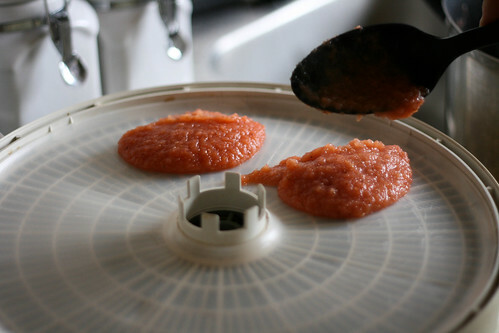 At this point, you should taste the puree to see if it needs sugar. Most fruit is naturally sweet enough that you shouldn’t need it, but if you have particularly tart fruit or a particularly sweet tooth, add sugar in small amounts until it’s right. 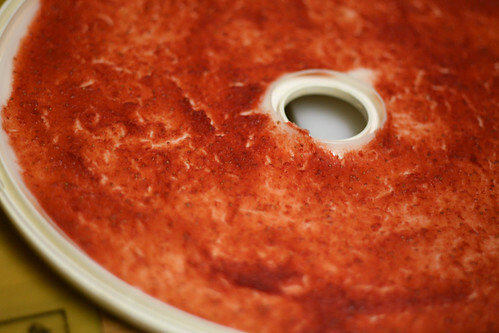 You can use a food dehydrator or your oven–just follow your food dehydrator’s instructions, or set your oven on the lowest setting and bake for about 8-10 hours. Yes, hours. This is a good rainy day project. If you use a cookie sheet, line it with parchment paper and spray or brush a bit of vegetable or olive oil over it. We didn’t use our Misto this time, but it definitely would have been helpful during the removal process. When the leather is sufficiently dry, cut into strips and store in an airtight container. i saw this on jessica’s blog, too!! now i really want to try it! where did you get your dehydrator? Oh my gosh, an updated food roll-up! So creative and such a great snack.. thanks for sharing!